Puppis A is a supernova remnant located about 7,000 light years from Earth. This new image includes data from Chandra and XMM-Newton and is the most complete and detailed X-ray view of Puppis A to date. The combined dataset reveals a delicate tapestry of X-ray light left behind by the supernova explosion. The destructive results of a powerful supernova explosion reveal themselves in a delicate tapestry of X-ray light, as seen in this image from NASA's Chandra X-Ray Observatory and the European Space Agency's XMM-Newton. 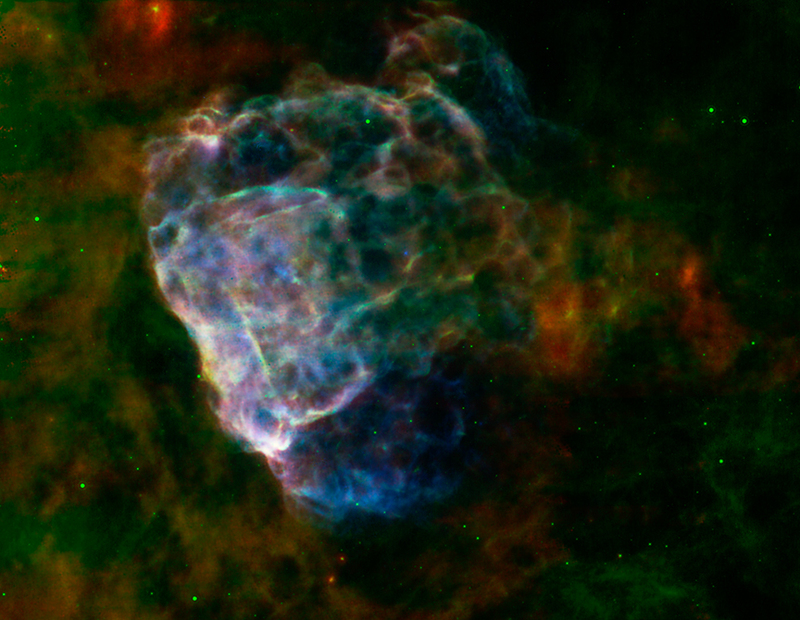 The image shows the remains of a supernova that would have been witnessed on Earth about 3,700 years ago. The remnant is called Puppis A, and is around 7,000 light years away and about 100 light years across. 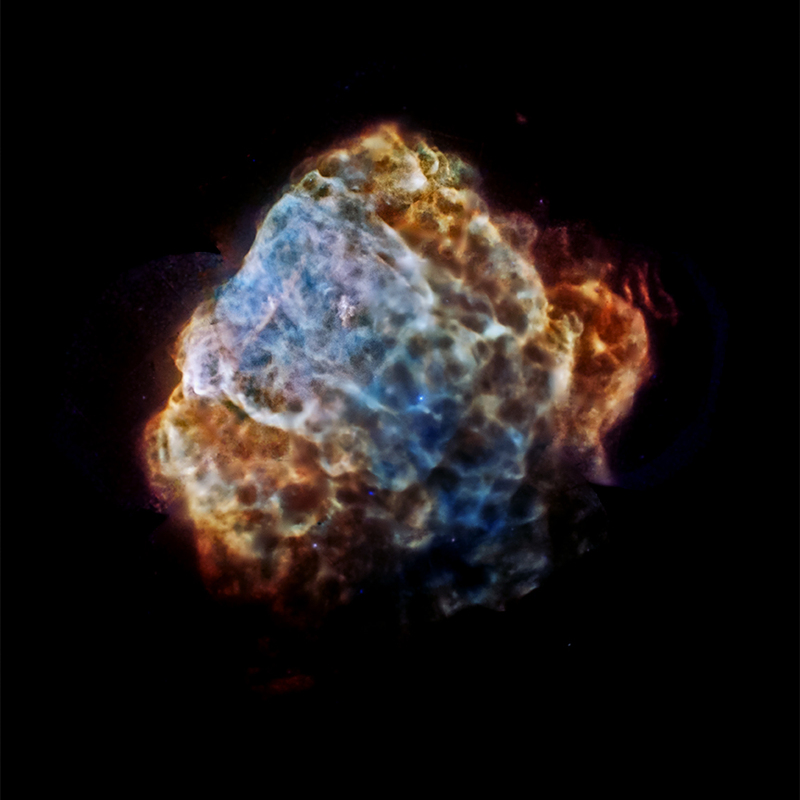 This image provides the most complete and detailed X-ray view of Puppis A ever obtained, made by combining a mosaic of different Chandra and XMM-Newton observations. Low-energy X-rays are shown in red, medium-energy X-rays are in green and high energy X-rays are colored blue. These observations act as a probe of the gas surrounding Puppis A, known as the interstellar medium. The complex appearance of the remnant shows that Puppis A is expanding into an interstellar medium that probably has a knotty structure. Supernova explosions forge the heavy elements that can provide the raw material from which future generations of stars and planets will form. Studying how supernova remnants expand into the galaxy and interact with other material provides critical clues into our own origins. A paper describing these results was published in the July 2013 issue of Astronomy and Astrophysics and is available online. The first author is Gloria Dubner from the Instituto de Astronomía y Física del Espacio in Buenos Aires in Argentina. Coordinates (J2000) RA 08h 23m 08.16s | Dec -42° 41´ 41.40"
Observation Time 44 hours 45 min (1 day 20 hours 45 min). There might be a pulsar in the center... should check X-rays and Gamma rays maybe. Is Puppis A located in the Constellation Puppis? And is Variable Star RS Puppis also located in the Constellation Puppis? This has helped me a lot but you can have some more pictures. In regards to Puppis A supernova remnant, you're never mentioning in which galaxy it is situated. It would be very appreciated if the galaxy in which an object you're talking about is always mentioned. It maybe so obvious for you guys that you think it's not worth mentioning but we re not all geniuses like you. There Appears to be a super black hole in the central region of this supernova. So exactly what is interstellar medium that probably has a knotty structure? What would make it knotty as opposed to just like everywhere else? how does that interact with interstellar gases? This image is so vivid I want to reach out and poke it, turn it round to see the rear. A magnificent image to show my Astronomy 102 students to support the topic of supernovae. Is the big white cloud surrounding the supernovais only composed by dust I mean what are its components and do they react together? About 7,000 light years from Earth. X-rays from Chandra & XMM-Newton. The image is about 180 light years across.